Listen to Steve Willits’ team preview of the King’s Knights by clicking on play button below. 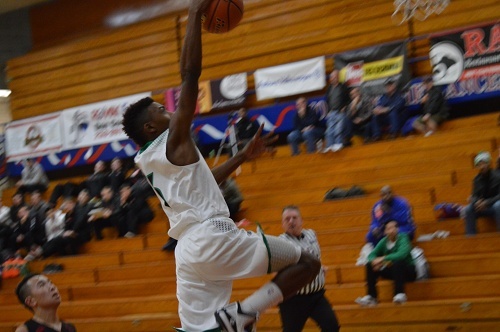 Game three of the first round of the Christmas Classic at Kennedy High School mashed up a 1A school in King’s against the 4A Royals of Kent-Meridian. The guard duo of Quincy Brown and Romaine Jackson would prove to be a tough matchup for a King’s roster loaded with forwards. However, Rick Skeen’s has prepared his Knights to be able to play up against higher classification teams. The Royals quickly established they wanted to run up and down the floor on both sides of the ball. King’s adjusted nicely and their ball movement was able to counteract KM’s energy. The backcourt presence of Royals guards opened up the King’s attacking zone and their superior ball-movement led to easy buckets. Seven Knights scored in the first quarter and as a result led 16-12 after the first quarter. KMHS head coach Brian Lockhart made a defensive adjustment in the second frame to apply slightly less pressure in the King’s backcourt forcing them to move the ball up the floor. Brown and Jackson began to jump into passing lanes and set up the Royals for some transition buckets. Junior Chris Lewis nailed another three pointer in the period; one of his five from downtown in the contest. 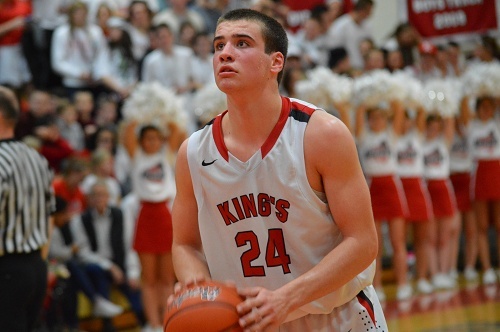 However, King’s was able to match their sixteen points from the first quarter to carry a 32-22 lead into the break. Trailing by double digits meant Kent-Meridian would have to take some chances on the offensive end to claw back into the contest. Shooting triples appeared to be their strategy in doing so. Lewis knocked down a pair from downtown in the third, but the team shooting percentage was low. King’s continued their gritty attack in the paint and protected their ten point lead going into the fourth. The Royals put together a solid fourth quarter, but failure to bury buckets from close range dashed their hope of vying for the lead. Freshman Knight Corey Kispert pulled down several critical rebounds in addition to scoring a game-high twenty points. When the buzzer sounded, King’s claimed a 64-56 win. With the Lakeside tailgate in the background, the Lakeside Lions fans hosted the Tigers from Granite Falls in a non-conference matchup at Lakeside High School. Granite Falls struck first on the third play from scrimmage with a 65 yard run from junior Matthew Hamilton, but a PAT miss kept the score at 6-0. Lakeside responded with three scores in a row, including a rushing and passing touchdown from quarterback Adam Hinthorne to take the lead 21-6, seemingly in control. But Granite Falls responded, needing to gather some momentum before the half, with a short touchdown scamper by quarterback Ben Nelson to cut the halftime lead to 21-13. The third quarter saw an explosion of offense and special teams scoring, with both teams putting 20 points on the board. Back and forth these teams went, battling on every play with great sportsmanship and composure. Granite Falls struck first with another Matthew Hamilton TD run and a 2 point conversion to tie the game at 21. The Lions answered with a Hinthorne touchdown run, only to be outdone by a Michael Green kickoff return on the ensuing kickoff to cut the Lions lead to one, 28-27. Lakeside responded with another score, but again came Green, returning the ensuing kickoff for another special teams touchdown. Granite Falls failed on their 2 point try, and trailed 35-33. This is the closest the Tigers would come to stealing a win on the road. Lakeside scored the last two touchdowns of the game, both catches by junior tight end Erik Rottsolk, to seal the 48-33 win. 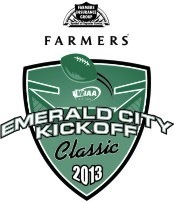 In the second contest at Husky Stadium for the Emerald City Kickoff Classic the King’s Knights took on the Lynden Lions. Lynden won the 2A state championship last season but suffered one loss on the year, to these Knights. King’s received the kickoff and put together a long opening series drive, taking over 6 minutes off the clock, but fell inches short on a fourth down run to turn the ball over on downs. Lynden responded with a 4:30 drive of their own and an excellent touchdown pass from Lucas Petersen to Jalani Phelps to take the lead 7-0. Lynden continued to drive the football offensively, giving their kicker a field goal opportunity later in the second quarter, but it missed just left. The Lions kept up the defensive pressure as well, not allowing King’s to find any cohesiveness on offense in the first half. Lynden forced a three and out late in the second quarter and capitalized at the end of their ensuing drive with a 2 yard touchdown run by junior Trent Postma to go ahead 14-0 at half. The Knights began to move the ball with more efficiency in the second half, putting together longer drives and scoring opportunities. Their first legitimate scoring chance came early in the fourth, where they earned a first down inside the Lynden 20 yard line. But Lynden’s defense held tight again, and forced another turnover on downs. 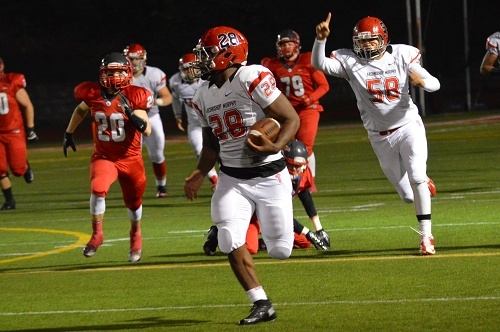 King’s found another opportunity in the waning moments of the contest and converted a ten yard touchdown pass from Corey Kispert to Jordan Turner, but it was too little too late, as the Lions avenged their loss from last season and won the opener 14-6.